This has been one crazy month - I'm ending the year just the way its been all year...busy, busy, busy. I'm still trying to get a grip on my schedule and make time for everything I have or want to do. In between all the work, Christmas shopping, cooking, homework, baseball and dance practices I did manage to make time for some fun and memorable activities. In the last 2 months we've gone apple & pumpkin picking and took a short trip to Hershey Park, so I definitely wanted to add something fun this month! 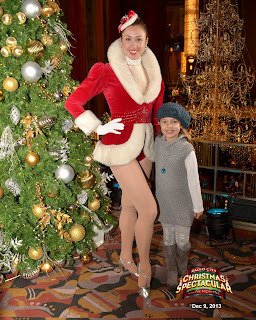 We always try to take a trip to NYC during this time to see the tree, but since my daughter LOVES dance and now has a sudden interest in going to see musicals and plays, I got us tickets to the Christmas Spectacular at Rockefellar Center. I used a coupon I picked up at a McDonalds one day and bought our tickets for a decent price. I chose a Monday, so both hubby and I took the day off from work and I kept the kids home from school. We jumped on the bus, to save money on the parking and toll, and made our way to NYC at 9am! I have to admit we all had fun and the show was great!!! Disney Store is absolutely beautiful!!! Love it! These guys weren't great but baby girl wanted to stop - then I was shocked when they asked for tips!! I never knew they asked for tips!! This totally made her day!! Last stop - Toys R Us.....WOW!!! This was a great day!! A few days later, baby girl had her Christmas concert and she did a wonderful job! Now its time for Christmas.......next post you'll read all about our little Christmas celebration at home and our little elf's appearances!